A blank canvas or sketch pad can be daunting but does it need to be? It is one more hurdle that we, ourselves have imposed. In the grand scheme of things does it really have to be such a big deal? Of course not. So, open your sketch book, get your blank canvas and just look. What’s the worst that can happen? You create something you don’t like. Remember that art is a process and the outcome is just one part of that. The process is the journey to the outcome and along the way there are bound to be creative outcomes that you are unsatisfied with but this is how you will learn what you like and what you don’t like. A limited budget can impose limited creativity within our subconscious mind. Free your limitations by simply and literally thinking outside the box – use the packing card as painting supports, try drawing onto brown paper with pastels, ink pens or white chalk (from your garden? 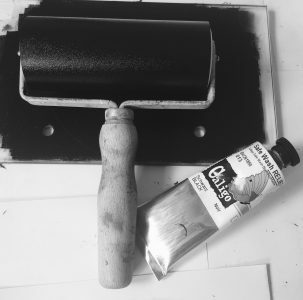 ), print onto household printer paper…exploration is the key that will unlock and continue to develop your skills as an artist. The images I share with you today are a direct emotional response to a deep feeling of wellness. Orange bursts out of the bright blue. For me it is authenticity, an expression of one moment – it cannot be right or wrong, it just is. Just start, somewhere, anywhere. How about on a post it note? The point is to just do something. But what? You may well ask. How about a shape, a free flowing line, a pattern, a doodle..? Previous Post Latest Weekend Offers!